Dr Sunil Chopra BSc, MBBs, MRCP is a member of the British Association of Dermatology. He is fully accredited and is registered with the General Medical Council. His specialist interests include skin cancer, scalp problems, pigmentation problems, acne scarring and rosacea. Dr Chopra's undergraduate training was at University College London and he did his postgraduate medical training at University College London and Chase Farms Hospital. He also did one year's training in chest medicine at Addenbrooke's Hospital in Cambridge. 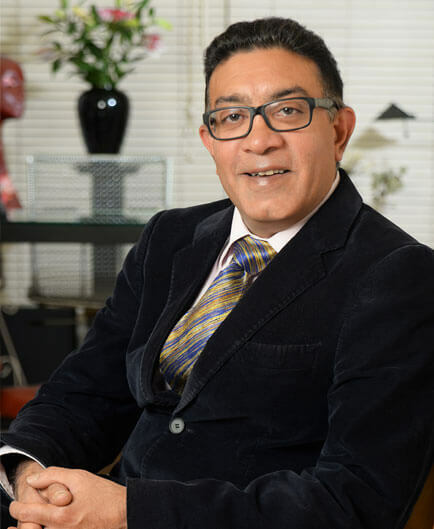 Dr Chopra spent two years carrying out full time research on the blood and nerve supply of skin, two years working at University College London, two years at Hammersmith & Ealing Hospitals and two years at Bart's & The London Hospital. Dr Chopra works primarily at The London Dermatology CentreTM. He also runs a research group into skin cancer and its possible treatments. He has invented an anti-cancer drug which has shown great initial promise. Dr Chopra recently received 'Professional of the Year' Award from Asian Voice Magazine. Phenotypic and clinical differences between Caucasian and South Asian patients with psoriatic arthritis living in North East London. 69 Wimpole Street, London W1G 8AS. Copyright 2018 London Dermatology Centre. All Right Reserved.